A platform built for publishers, providing the data needed to make informed decisions about content compensation and offering consumers multiple options of paying for the content they love. The General Data Protection Regulation (GDPR) is a major piece of legislation set to transform the way publishers collect and manage consumer data. 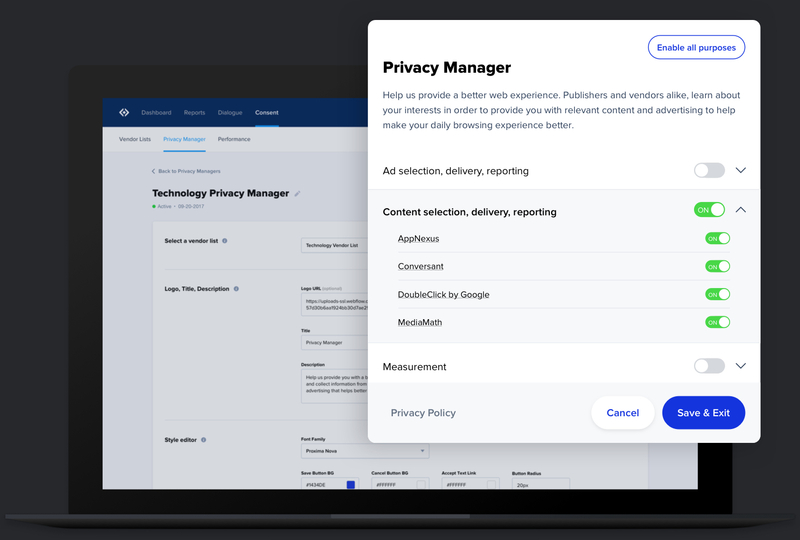 To empower publishers with the technology and tools to address these new guidelines, we have developed a Consent Management Platform (CMP) that makes it easy for organizations to achieve compliance with GDPR and other privacy laws requiring notice and consent. Sourcepoint’s CMP was built on our Dialogue™ platform, which offers publisher robust A/B testing functionality, audience segmentation, targeted messaging customization, and reporting to better understand users' compensation preferences. Publishers have relied on an implicit understanding that consumers paid for their content by consuming advertising. 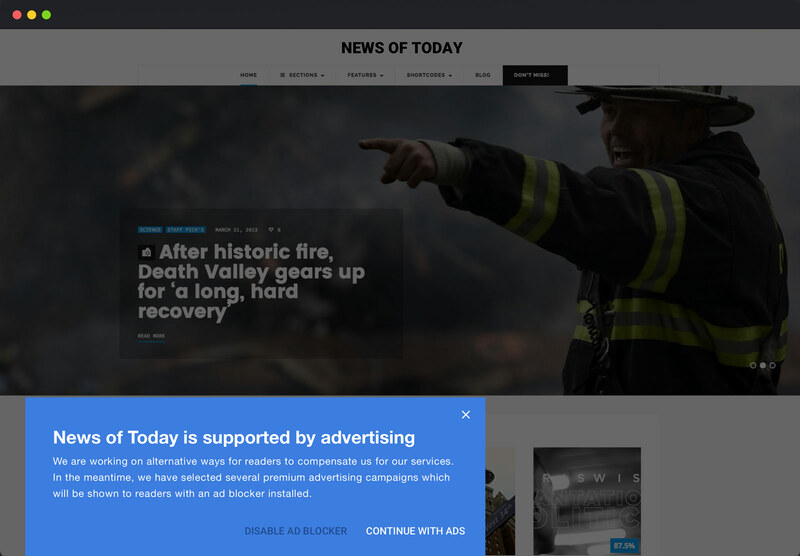 Ad Block usage has brought this issue to the forefront. We enable publishers to address the root of the problem, and communicate with their users about compensation choice, establishing clear and transparent value exchange. Consumers are largely unaware that advertising funds content they read on a daily basis. Frustration with advertising practices that impede on user experience and create privacy concerns. Wireless carrier and hardware blocking demonstrate increasing trend towards "Ad Block By Default". There's no “silver bullet” to enable publishers to meet the needs of their users. Our platform provides a complete set of tools that empowers publishers to tailor their content compensation solution to their specific needs. With our enterprise-grade technology and world class service, we enable publishers to communicate with their users about compensation choice and establish a clear and transparent value exchange. We provide publishers with measurement and detection technology to help accurately identify the size and scope of their ad block audience. In addition to reporting on how this audience changes over time and across properties, geographies and devices, publishers can analyze which compensation strategies are most effective and optimize their offerings to best meet the needs of visitors. Our messaging product serves as the foundation for publishers to establish transparent value exchange with their audience. We supply publishers with a robust toolkit to deliver compelling, customized messages to start a conversation about compensation preference. These messages can be deployed with an accompanying “content lock” to require some form of alternate compensation in order to access content. Our reporting enables publishers to understand the performance of Dialogue campaigns and ensure there is ongoing optimization that balances appropriate compensation with consumer preference. 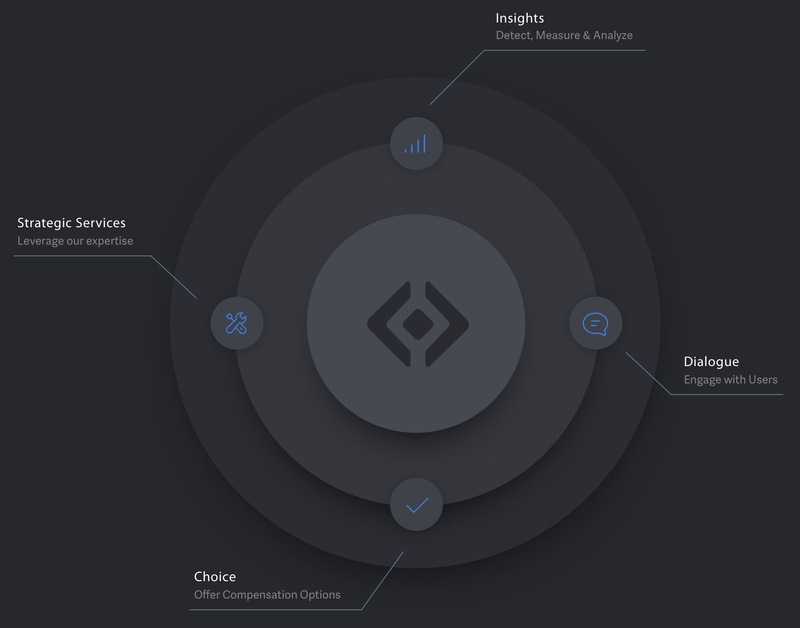 We provide a range of compensation options for publishers to provide to their users. 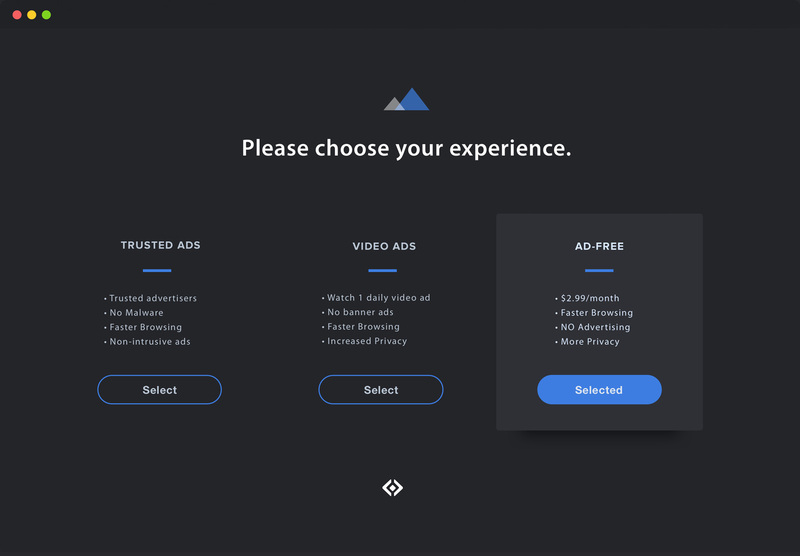 Users can opt-in to a traditional ad-supported experience or choose a customized ad experience, catered to their specific preferences across display, video and mobile. This includes the ability to opt-in to an “Ad-Lite” or “Ad-Free” experience. 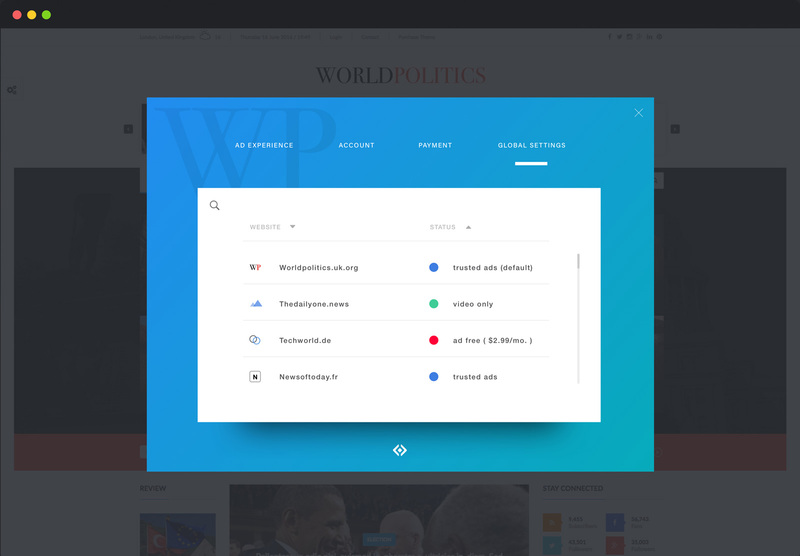 Publishers who have their own subscription packages can also deliver those subscription offerings to their users via the Sourcepoint platform. Provide an additional compensation option to your audience by participating in Sourcepoint's multi-publisher subscription offering. Contentpass is complimentary to your existing paywall or site subscription offering and enables your users to make an explicit monetary payment in return for accessing content across a wide breadth of digital content across multiple publisher's sites. The content compensation landscape is evolving rapidly. Our Strategic Services offerings are designed to compliment our technology products and arm publishers with the knowledge and best practices to pick the right content compensation strategy. Sourcepoint's Consent Management Platform, has been launched!